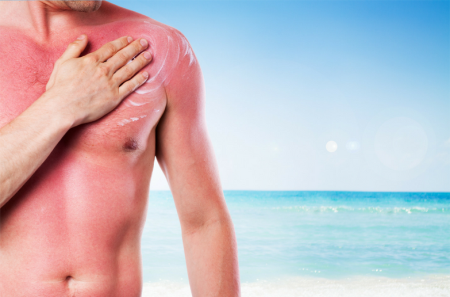 Sunburned skin is a common ailment during the summer months. So since summertime is quickly approaching, now is a great time for me to share a few tried and true “tips a tricks” to help alleviate the pain of sunburned skin! Baking Soda – Adding a few heaping tablespoons of baking soda to cool bath water makes a quick skin-calming remedy. Just limit your soaking time to 15 to 20 minutes, any longer makes for even drier skin. Oatmeal (yup, that’s right!) – Fill the tub with cool (not cold) water, add 1/2 to 1 cup oatmeal and mix in, this makes for a perfect skin soother! Aloe Vera – Available in almost every grocery store. Aloe Vera causes blood vessels to constrict, taking the sting and redness out of the sunburn. Simply slit open one of the broad leaves and apply the gel directly to the burn. Apply five to six times per day for several days. Drink Water – As the sun “cooked” your skin, it also dehydrated it. Being well hydrated will help burns heal better and faster. Potatoes (yea, I said it!) – It’s a time-tested technique known world-wide. Take two washed potatoes, cut them into small chunks, and place them in a blender or food processor. Blend or process until the potatoes are in liquid form. Pat the burned areas with the pulverized potatoes. Wait until the potatoes dry, then take a cool shower. Moisturize – Immediately after a cool soak, apply moisturizer. For cooling relief of pain and dryness, chill the moisturizer in the refrigerator before using. For even better results – choose a cream that contains aloe vera and green tea extracts to restore moisture, sooth your skin, and reduce inflammation. **Final suggestion… There’s always the option of an over-the-counter pain reliever (i.e aspirin or ibuprofen); however, make sure to take with food and read the instructions on the bottle. Have a great summer and be smart!